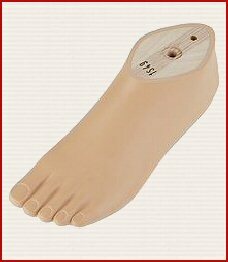 The base component of every lower limb prosthesis is the prosthetic foot. Thru the years there have been many designs and theories to devise a single component that best mimics the motion of the human ankle and foot. Currently there are three categories of prosthetic feet available to the amputee. The first category or design style is the sach foot. An example of a sach foot is shown in the photo above. It was the first commercially manufactured foot and its name was derived by it's design: sach ( solid ankle cushion heel ). 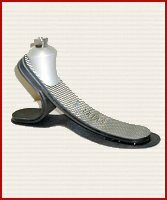 With no ankle motion the sach foot design principal is at heel strike the the heel compresses to reduce terminal impact, and to allow a smooth transition to foot flat. Then the flexible keel allows a smooth rollover to toe off. 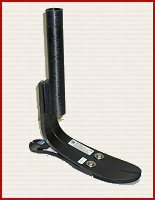 The sach foot has a simple yet functional design and with it's low cost is still used quite frequently. The second category is the dynamic response foot. It shares alot of the same design characteristics as the sach foot. Using a cushion heel like the sach foot for heel strike to foot flat properties, the dynamic response foot adds a stiffer keel to propel the foot at toe off. This design feature is what leads us to the third and most widely used category. The third category is the energy storing foot. The first true energy storing foot available was the Seattle foot, with it's life-cast form and delron keel that provided resistance during toe load and releasing this stored energy during toe off. This design feature of toe loading and subsequent releasing that propels the foot into the next step is the basis of all energy storing feet. The latest versions now use carbon fiber blades for the heel and keel plates. Under wieght bearing these blades move and flex to provide propulsion during the entire gait cycle. Today there are many different design styles of energy storing feet, but all are based on this propulsion theory. Shown below are three versions of energy storing feet. The first is the Silhouette foot from Freedom Inovations, the second is the Trias foot from Otto Bock. 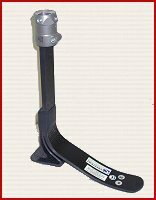 and the third is the Vari-flex foot from Ossur. Although these three feet look radically different they all achieve the same function of allowing the amputee to walk with less energy consumption. are between 3 to 5 precent, unlike the exaggerated claims from their manufactures. Even though the actual amount of energy saved may be disputed these feet stiil provide a solid base to build from. Also another key feature to these carbon bladed feet are their inherent light weight design. By reducing the swing weight, they allow the amputee to walk with a lighter feeling prosthesis.